ABCmouse.com’s preschool reading curriculum includes many online preschool reading activities that stress those aspects of reading that are most important for very young learners: increasing oral vocabulary, developing phonemic awareness, and learning the names of the letters of the alphabet. When your child reads, he or she looks at the written words on a page and decides what spoken words the written words represent. But that doesn’t help your child understand what they are reading unless they also know the meanings of those spoken words. The collection of spoken words that a child understands is usually called his or her oral vocabulary. The larger a child’s oral vocabulary, the more words he or she will be able to read and understand. There are many activities that support oral vocabulary development in ABCmouse.com’s preschool reading online curriculum; some examples are shown below. The letters of the alphabet represent the sounds that make up spoken words. In order to read, your child needs to be able to identify those sounds. For example, what are the beginning, middle, and ending sounds of the word dog? Your child might need to practice listening to sounds in words in order to answer questions like these. Reading experts call the ability to identify the separate sounds in spoken words phonemic awareness. For many children, practicing the ability to recognize sounds in words can make a big difference in how fast they learn to read. 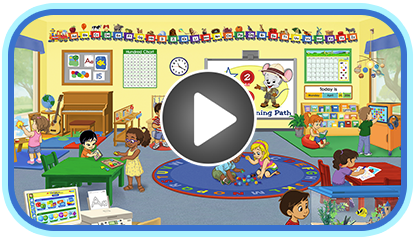 ABCmouse.com’s online preschool reading curriculum offers a wide variety of books, songs, games, and other activities that will help develop this skill in your child. Research indicates that learning the names of letters leads to more rapid and accurate learning of phonics. This is reflected in the earlier levels of ABCmouse.com’s online preschool reading curriculum through many activities that support learning the names of uppercase and lowercase letters.